It is much safer to have a sharpened knife than a blunt one. If you are in the middle of cutting something and it frees itself from your hand unexpectedly, there will most likely be an ongoing momentum that may slash you. It’s more dangerous if you use a blunt knife and apply additional force when cutting something than if you use a sharp knife. With a sharp knife you can cut and slice through things with ease. The more you use a knife, the duller the edge gets which is why you need to sharpen it regularly. Also, the edge can and will turn either to the left or right; it all depends on the way you hold the knife when you’re slicing or cutting things. Always buy quality knives which are usually made with vanadium alloy, carbon or molybdenum, as they have great elasticity and can be realigned easily by using a sharpening steel. Put the knife blade on the tip of your sharpening steel. Do this at an approximate angle of 20 degrees. Then pull your knife down across the steel with a little arch. In order for you to sharpen the other side of the blade, do the process again but this time on the back side of the steel. Repeat the second and third steps anywhere from two to ten times, switching between both left and right side of the blade. Please note that it is vital to do this at a 20 degree angle and run the blade along the steel at full length. The speed at which you do this plays no role in making your blade sharper. If you happen to know what angle your knife is sharpened at, then it’s worth sharpening it at that same angle again. If you sharpen at a different angle, it may take you longer to smoothen out the rough edges. If you don’t know which angle your knife was sharpened at then you can ask your knife manufacturer or find out from a knife expert at a knife shop. This should help you determine the appropriate angle to sharpen your knife at. You may be surprised to know that a coffee mug can be used as a great substitute for a proper sharpening tool because the material it’s made from (ceramic) is a course to a point where you will be able to smoothen out the rough edges. Get hold of an old coffee mug and place it upside down. Make sure you maintain a 20 degree angle and sweep both sides of the blade across the coarse part of the mug. Run the full length of the blade across the grit several times. For the final sweeps, alternate between both sides of your blade. Run one side of the blade across the coffee mug and then get the other side and do the same. Repeat this for a few times. Finish this process off by swiping your blade across a honing rod 6 to 8 times. This smoothens out any kinks or burrs in the blade. This is a very cheap method of sharpening a knife. All you need to do is attach some sandpaper to an old mouse pad and run the knife along the sandpaper at a 20 degree angle. You can use this as a primary method for sharpening a knife or for finishing touches after you’ve used a Sharpmaker or a stone. 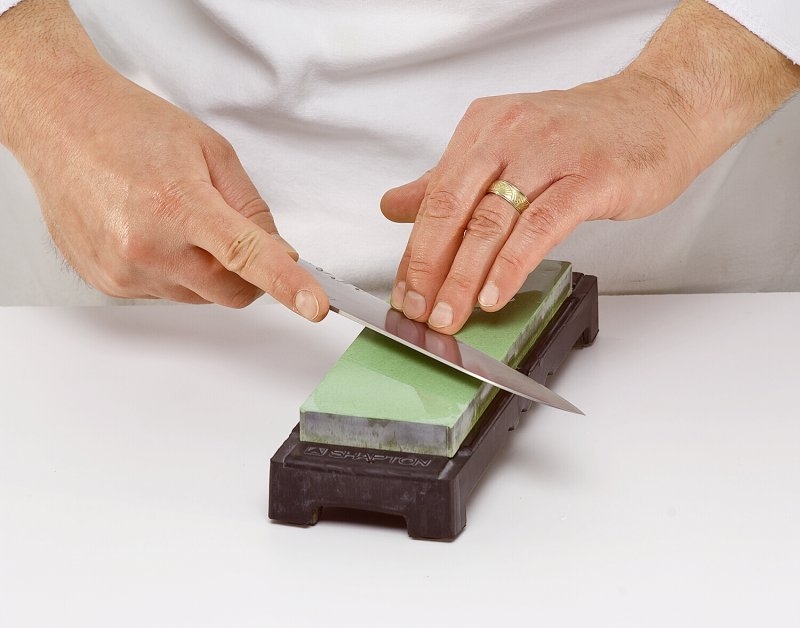 If you are sharpening a dull knife, use a sandpaper with medium grit and sharpen away until you get a fine grit. The space in a mouse pad lets you make convex edges. Refrain from re-profiling a beveled edge into a convex edge unless you have a lot of experience with sharpening knifes. You can find pull-through sharpeners for kitchen knives and also for field sharpening outdoors blades. Using this isn’t really a great method when you think about how to sharpen a knife though, because they never produce results that are consistent, they create burrs and they tend to pinch the blade. This is a great option because you won’t have to worry about whether or not your knife is sharpened properly. The best professionals don’t use a grinding stone because it takes away more material that needed from the blade, thus decreasing its lifespan. Although sending your knife to a professional can be quite pricey, it’s a great way to maintain your knife and its lifespan. Not seeing progress when sharpening a knife usually happens when you’re doing it for the first time with a knife that was supposed to be sharpened a long time ago. Sometimes you’re better off replacing a knife instead of constantly switching sharpening techniques when you see that one isn’t working. If you don’t want to get a replacement you can try and sharpen until you get the edge sharpness you want. It’s best to sharpen for a few minutes, take a break then come back and continue it. Also, keep in mind that if you are sharpening a really worn out blade, it can take well over 30 minutes to get it nice and sharp again. What are you using the knife for: light slicing or heavy cutting? The steel quality you’re working with, will it hold a steep edge? Use cutting boards made from bamboo, wood or special plastic boards as materials such as: marble, glass and granite can be damaging to the blade. When transferring ingredients from the cutting board into the board with your knife, use the dull side to do it. For anything larger than tomatoes, use a 6-8 inch blade. Sharpen your blades in the same direction every time the blade gets dull. Protect your knife blades in a special container or a knife block. Server responsed at: 04/25/2019 1:58 p.m.